These open-collector Hall-effect latches are capable of sensing magnetic fields while using an unprotected power supply. The A3197LLT and A3197LU can provide position and speed information by providing a digital output for magnetic fields that exceed their predefined switch points. These devices operate down to zero speed and have switch points that are designed to be extremely stable over a wide operating temperature and voltage range. The latching characteristics make them ideal for use in pulse counting applications when used with a multi-pole ring magnet. Thermal and output short-circuit protection allow an increased wiring harness fault tolerance. The temperature compensated switch points, the wide operating voltage range, and the integrated protection make these devices ideal for use in automotive applications such as transmission speed sensors and integrated wheel bearing speed sensors. 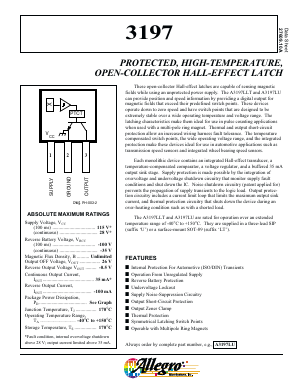 AH278 HIGH VOLTAGE HALL EFFECT LATCH View Diodes Incorporated.